A pimple occurs when sebum — the lubricant that naturally moisturizes our skin and hair — is trapped under dead skin cells and debris in a hair follicle, according to the Mayo Clinic. Typically, sebum rises to the surface, where it is able to condition the skin. If it gets trapped, it creates an ideal circumstance for bacteria to grow. 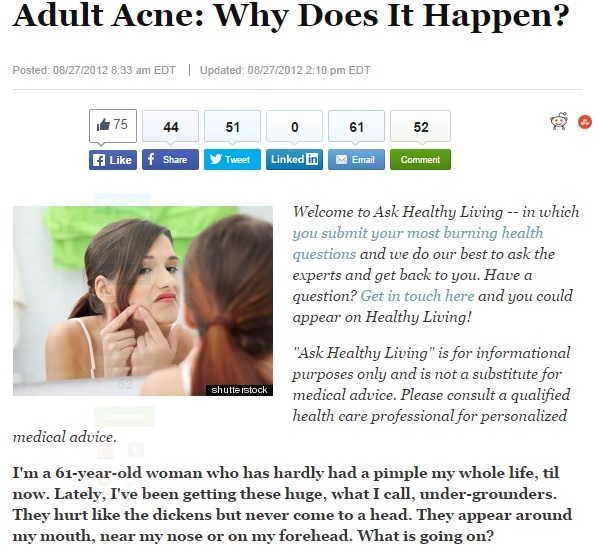 In other words, hormones practically get the blame for acne breakouts even way after the teenage years. However, there are still other factors that few people know of. Regular facial hair removal is one of them. Constant waxing, tweezing, and shaving also greatly contributes to acne by making skin tissue swell and this paves the way for bumpy skin. The swollen, bumpy appearance of the skin allows acne-causing bacteria and dead skin cells deeper access into pores. The way people live today compared to how life was a few decades ago is also identified as a root cause. For one, the food people ate didn’t sport much scientific “improvements” or alterations, and stress wasn’t exactly a common part of one’s vocabulary or daily life. These days, majority of people are eating and drinking scores of chemical- or preservatives-laden foods and beverages. Stress has also been identified as a major acne-causing factor. Speaking to the Huffington Post, dermatologist Dr. Anne Chapas notes that the two types of stress—psychological and physical—release the same type of hormone: cortisol. This hormone has been strongly linked to acne breakouts in most people; a link that was proven by a Stanford University research which observed students developing acne at around stressful exam periods. Thanks to advancements in dermatological technology and procedures, natural skin care treatments in Folsom and elsewhere are available regardless of what causes an acne breakout in the first place. Please contact The Healing Station today at 916-294-9980 or visit www.TheHealingStation.net and click “Schedule Online” for any skin care, wellness or Folsom massage care needs.